Hello lovelies… Today I am so thrilled to be teaming up with the gorgeous Amy from one of my favorite daily reads Coffee Beans and Bobby Pins. All I can say is great minds think alike! I love how we both kept our looks simple and chic, yet with our individual style spins. To me, Amy always looks fab and on point! Her top is to die for, those silver heels are perfect and that red bag?! Love. And I have to add that her hair is GORGEOUS this color as of late. I am smitten with tulle! And this is the perfect time of year to wear it and wear it often!! I feel like the tulle skirt itself is such a statement, that when I added the sequin top, I knew that was enough. I did not want to look like I was cast from the Nutcracker (as much as I love it) but wanted a look that a 30-something in a tulle skirt seemed age appropriate. And let me tell you that I wish I could wear this skirt often! Make sure you head over to Amy's blog Coffee Beans and Bobby Pins to check out all of her outfit details here. You look incredible! I love the tulle and the sparkle! Is this skirt hard to make? My sewing skill is sewing a button on. Let me know. I want one like the one you make. I like the fullness. Honestly, it wasn't hard at all. My sewing level is pillows and anything square! Lol My mom gave the machine to me as a wedding present, it came with one class and the rest I figure out on my own ;] I would give it a try if I were you!! I am going to make another one that is non-sew. Maybe I will hurry up now!! Stopping by from Totally Posted Tuesday! I love this look! I don't know if I could pull off a tulle skirt for every day life, but for a party it would be so fun! You and Amy both look fabulous!!! I am in love with those pumps too!! Thank you so so much Barbie for linking up each week! 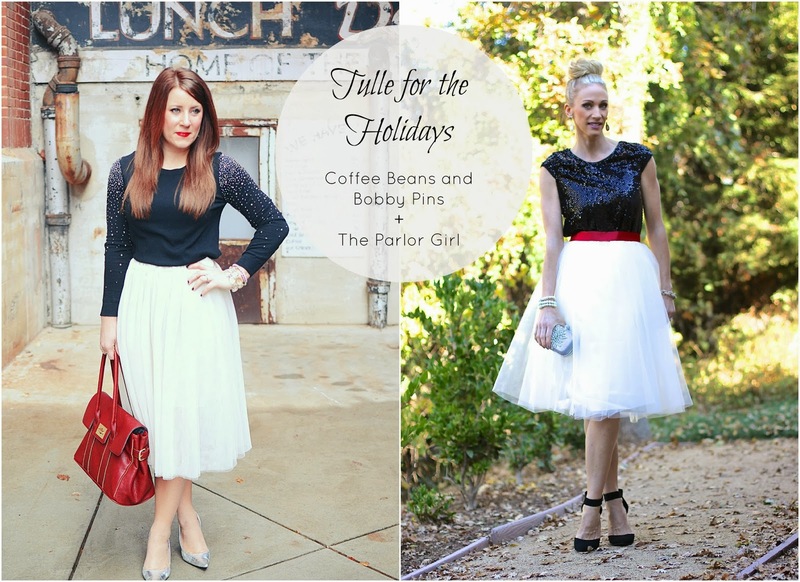 What a gorgeous holiday outfit - I am obsessed with the tulle skirt!